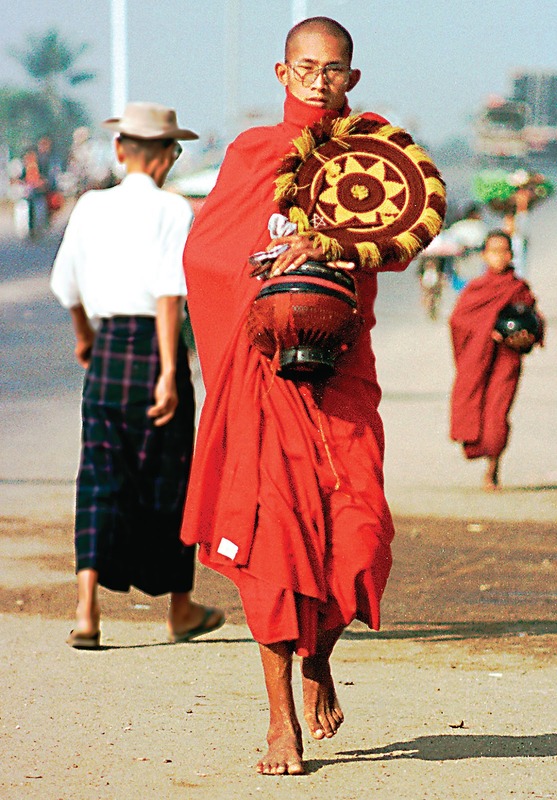 For Myanmar Buddhism the popularly accepted tradition is that it came to Burma through two Talaing merchants known as Taposa and Palika who were converted by the Buddha and to whom he gave eight hairs of his head. 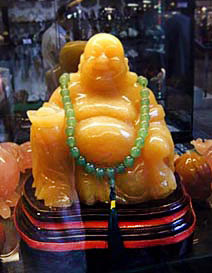 Buddha statues and pendants are very popular in Burma until today. Over time plenty of sects developed with its own doctrines and legends. Although it has produced not much mythology of its own, it has incorporated legends of various regions. After the third Buddhist Council missionaries were sent out to Kashmir Ceylon Egypt Greece and Syria. 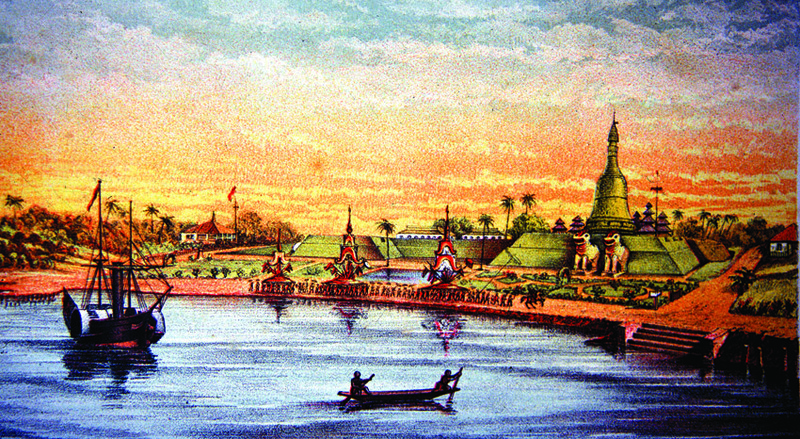 The monks Sona and Uttara are said to have landed at Thaton which was then a seaport. 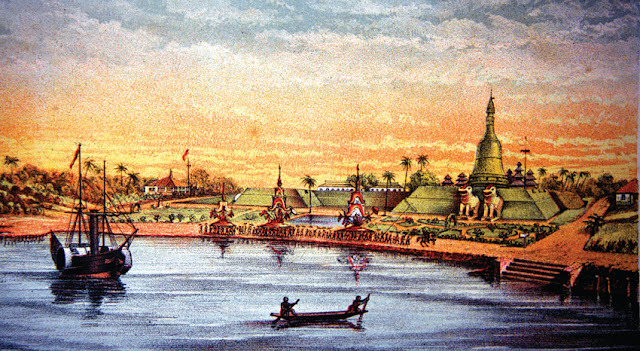 The Mahamuni BuddhhaTemple and Pagoda. 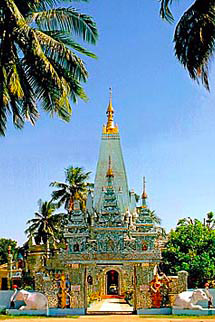 The Monywa Thanboddhay Buddha Temple. A wider perspective of global Buddhism. They came back and searched far and wide for Theinguttara Hill, which was finally pointed out to them by the aged Sule nat. 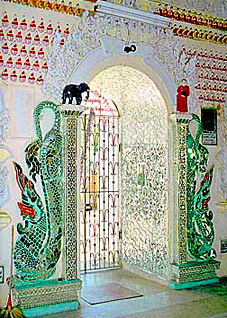 Here they enshrined the hairs in a sacred monument which came to be later known as the Shwedagon one of the most sacred Buddhist shrines in the East. A pagoda was later built to commemorate the nat who had pointed out the sacred site ; this is the present Sule Pagoda which stands in the centre of the city of Yangon. 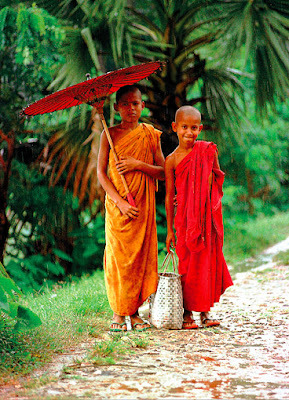 A more probable tradition is that, that Buddhism was brought to Burma by two monks, Sona and Uttara, who were sent out by the Third General Council, summoned under the patronage of the great Emperor Asoka, who flourished in India about 250 B.C. After his victorious war against the Kalingas, in which 150,000 men were killed, Asoka filled with remorse and horror was converted to Buddhism. Shortly afterwards he entered the Sangha and for the rest of his reign ruled on philanthropic principles. 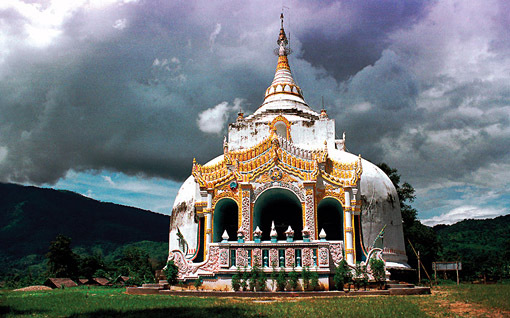 The Myanmar Buddhist shrine picture at right was taken in the mountains of Kachin state. Little more is known of the progress until the first century A.D. when it was so flourishing there, historic data tell they had thirty sets of Pali Scriptures in the royal library. Meanwhile a decadent form had penetrated into Central Burma, probably one of the Tantric magic-working sects which had sprung up in India during the period of decline and had entered the country by the overland route from Tibet. The priests of this degenerate faith were called Ari and indulged in superstitious and immoral rites. 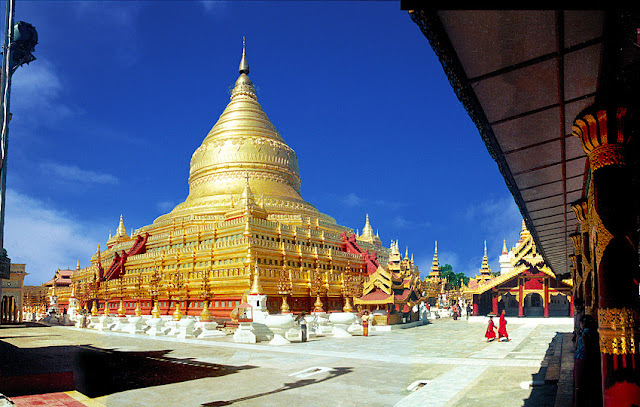 The religion is of the same version similar to the Thai version which is a philosophy which is probably the most human-oriented of any here is one of the holiest places for Buddhist the "Shwedagon Pagoda" in Yangon. The spirit is real-world oriented and less ideological this is living Buddhism not only in monasteries. Buddhism is a bit different to other religions such as Christian and Muslim which were Invented by people who are not capable of handling their life and they try to pass the problems to some "holy ghosts" maybe they can solve them very comfortable and full of lies. Here is one of the most venerated Buddhist Shrine the Shwedagon Pagoda in Yangon Myanmar. Buddhist philosophy was founded in India around 500 BC and made its way through Asia first to Tibet after to China Sri Lanka and Myanmar or Burma after Thailand and slowly expanding its footprint. Buddhism is not a real homogeneous religion as most other are, there are always sects with their own rules, believing and mythology, often in a combination with people issuing strict rules and telling all other human are more or less not good as it is usual in Islam where it is clearly postulated that all non-Muslims are so-called non-believers. Starting as a Buddhist in Myanmar means first process through novitiation that is when the children are around 6 years old they will stay in a Buddhist monastery for a couple of days. This is against some of the basics human social behavior and there is clearly no willingness to update or change anything, if a Muslim does any thinking of his own they stone him or her. But besides of all this diversity and variants, there are some common values among are the prayer in the Buddhist Monasteries and Pagodas plus temples. There are many ideas and local and national versions the whole is characterized by complicated dogmatic expressions. One of this is the doctrine of the eternal changeability in the world and the lack of an eternal soul, the doctrine of the reincarnation, rebirth, karma and the belief in the inevitable practical effect of human activity. Today learn them in a Buddhist retreat. The main directions of Buddhism are called Theravada or Hinayana "Little Vehicle", and the Mahayana "Big vehicle" but in all versions Buddha as the main object of veneration. The follower in Asia and all over the world still take the teachings quite serious since it is not so much directed to a "God" who watch over the local ghosts and deities as it is in Myanmar and Thailand e.g. They have their local Nats which are the ghost of dead people living in the trees or small spirit houses, they also have this in Thailand where practically in front of every house is a small spirit shrine. Since it was started in India no wonder that there have been and still are influences of Brahmanism which is again a variation of Hinduism. Over time all countries created their particular styles to present it to the believers. Source of all was Siddhartha 'The Buddha". This was a prince from a state in northern India where his father Suddhodana was king, he was born around 563 BC. In the center is Gautama as the main object of veneration. The word "Buddha" is not just a name. It means "the enlightened one". 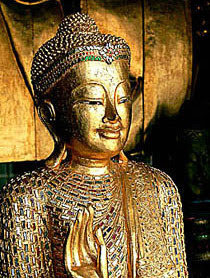 There were countless incarnations before but the highest veneration was Prince Siddhartha. 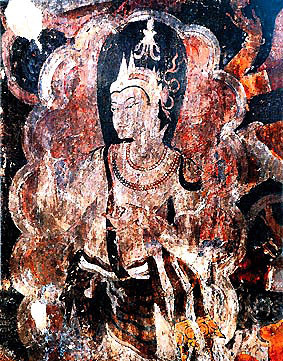 The mural painting below is from an ancient Buddhist Temple Dome in Bagan Myanmar. 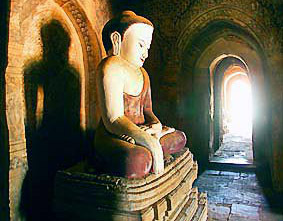 This sitting Buddha sculpture in Bagan was created in a way that the sunlight come in through different domes according to the sun position of the day. Myanmar or Burmese people are dedicated to Buddhism which doesn't mean some kind of animism is not existing mainly by worshiping the Nats. The dedication to the religion is visible everywhere you travel in form of Pagodas Temples and Shrines they are built since more than 2000 years and the most famous is the Shwedagon Pagoda in Yangon / Rangoon. Since British colonial times the country has a substantial amount of Christians which are the Karen on the east side border to Thailand and Chin in the northwest. 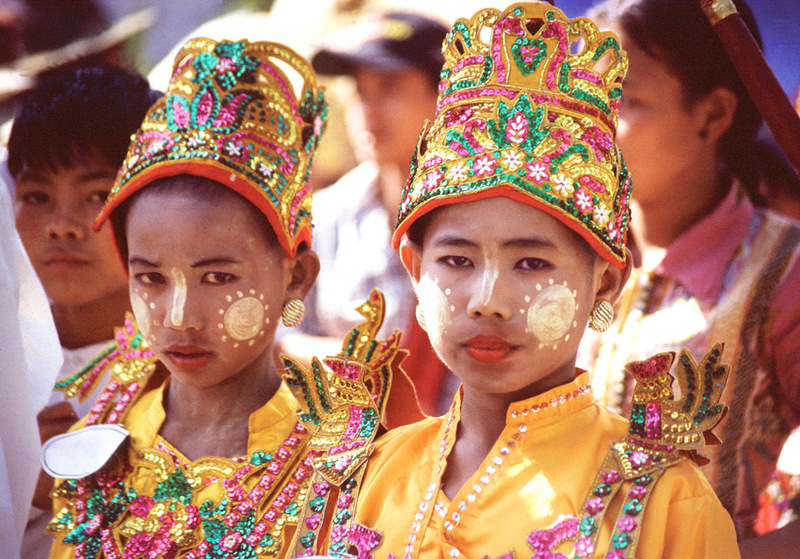 Karen and Chin got their new religion through missionaries the British brought into Burma during colonial times. There is also a very large community of Burmese Muslims since many people who migrated to the country during colonial times brought Islam from the Indian subcontinent plenty of pretty mosques and the muezzins noise are the result. But the absolute dominant religion is Buddhism since over 2000 years. 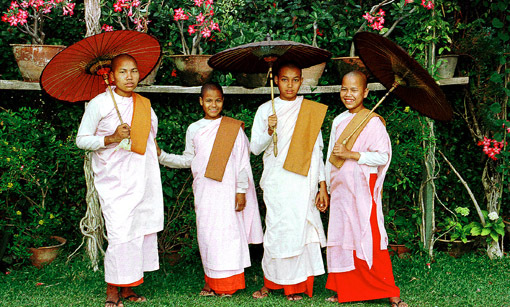 Although Buddhism Christianity and Islam are the three most universal religions as they are not nation specific. The totally opposite to Buddhism are religions such as Islam and Christianity who claim only they are right in terms of religion. As a matter of fact one can easily distinguish a primitive from an advanced and humanitarian dominated religion by checking the tolerance giving to others with a different thinking pattern.Buddhism is a rather modern philosophy it's more than 2000 years old but the elements of pluralism and humanity are definitely included. This more or less Indian idea is on top of any by this parameter. Here nobody gives you a problem when you think in a different way in Islam if you think different, they stone you they hang you and they kill you by some other means, strange religion isn't it ? Currently (2018) the worst is Saudi Arabia Pakistan Afghanistan Bangladesh and to some extend Indonesia. As a matter of fact, they do even the same when a women make some "winkle - twinkle" to the other guy and the Turks Kurds Moroccans and so on even kill their sisters and brothers if they mingle with people of another religion this happens in the 21. century. Prices are on the high end particular when there is real evidence that they are genuinely old since many fake items are around its necessary to be very careful when buying anything on top of it almost no country where they are available allows to export them and quite a few people were thrown into jail when they tried to smuggle old Buddha statues out of the country. 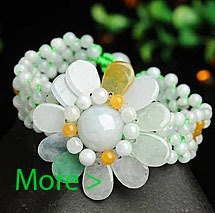 This old pieces of desire are real business and they make plenty of money usually at auctions since that makes it bit less transparent because it quickly disappears and no traces left. Especially the newly rich from China throw plenty of money when they think to get back some great heritage. That could be just the top piece of decoration in a newly built residence somewhere. From a certain amount of money they own it's only gaming and to try to play some games. Thailand is a mainly Buddhist country (there are also a lot of Muslims) and has some of the best Buddha related art plus exotic temples where they are on display such as Ayutthaya and Sukhothai. 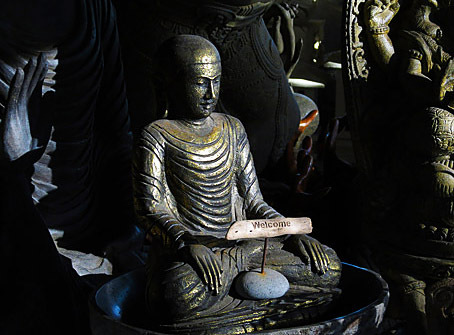 There are many others in museums monasteries, often just as home decoration and e.g. the Grand Palace in Bangkok. Actually, the difference between a Temple and the other is it can be entered just as walking into a Church or Mosque, the Pagoda, Stupa or Chedi is a solid construction and there is now way to walk in. Two versions have been constructed as buildings and in caves. These religions share the belief in reincarnation and karma, inclusive Indian gods called Devas and Asuras which are the demons. Legends tell about Amitabha who was a bodhisattva, means a person who found enlightenment but delayed his entering into nirvana to help others to gain enlightenment by meditation too. Here are Pagodas at Sagaing near Mandalay. A marvelous place with monasteries and Buddhist retreats is Mandalay and especially Sagaing which is just across the Irrawaddy River although the area in Central Myanmar is very dusty especially during the dry season. Which is somehow strange because having several big rivers around such as the Irrawaddy River which come down from the North Myanmar mountains.